Posted by sneaks in DVDs, great ideas, manga, YA. 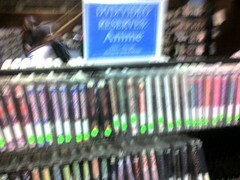 It’s hard to tell from this blurry picture, but this is EPFL’s Anime collection. Not many people realize that BCPL owns copies of Fullmetal Alchemist, Nausicaa, flcl, Princess Mononoke, and other popular anime DVDs. Why not highlight these titles by shelving them together – close to the manga if space and supervision permits.